Hamburgers that grow out of the ground like four-leaf clovers, mountain ranges carved out of ice cream, and warm servings of mac and cheese that stew deep within the stomachs of volcanoes fill the landscape. This world of delectable natural wonders has reached a prime age of exploration—the Gourmet Age! Citizens and chefs alike aspire to taste and prepare the finest dishes, while adventurers called "Gourmet Hunters" seek out delicious rare ingredients. The first episode is actually a two-part special called "Toriko x One Piece Collabo Special"—a crossover with One Piece. The first part aired during Toriko's timeslot at 9:00, and the second part aired during One Piece's timeslot at 9:30. That is also the reason why the second Toriko episode doesn't continue where the first one left off. Episode 51 is the first part of a two-part special called "Toriko x One Piece Collabo Special 2"—another crossover with One Piece. The second part is One Piece episode 542. The first part aired during Toriko's timeslot at 9:00, and the second part aired during One Piece's timeslot at 9:30. Episode 99 is the first part of a two-part special called "Dream 9 Toriko & One Piece & Dragon Ball Z Super Collaboration Special"—a crossover with One Piece and Dragon Ball Z. The second part is One Piece episode 590. The first part aired during Toriko's timeslot at 9:00, and the second part aired during One Piece's timeslot at 9:30. Prequel: Toriko 3D: Kaimaku Gourmet Adventure!! Other: Toriko: Barbarian Ivy wo Hokaku Seyo! "Cooking is as masculine as judo, kickboxing or tae kwan do. Anyone can fight but it takes a special man to craft the perfect Bolognese sauce"
You know the first thing that crossed my mind when I read that quote was covering a cow with ketchup then proceed to pound the cow into bolognese sauce. Well, introducing Toriko, the only anime currently airing that will not only satisfy that hunger urge but will also teach you how to be more MANLY than you were before. What would you say if I said that World Peace could be obtain if everyone in the world combined their powers to produced the most delicious full course menu in the universe? You would probably say "BURRRRRP!!" Cause that's how the end of World Hunger sounds like. Now all that's left is the homeless people. Let's see how this anime can be used to solve other problems? So you work with a bunch of unmotivated voice actors who does english dubs for an anime. Get them to watch Toriko. The seiyuus for this anime are top notch. They portray their character well in the anime. It's like the directors forced the seiyuus to starve during the recording to make them sound like a bunch of hungry men. What can I say about the opening? One word... "GATSU!!" No seriously, it's like getting your guts punched with a thousand fists of manliness. So you have a son, and he's a wimp. Nothing wrong about that, but he is due to national service soon. And you don't want the other kids to bully him. Get him to watch Toriko. Make him into a man. Toriko is an exampled role model.He says his prayers before and after eating his meal. How often do you see people say their grace before they eat? Not only that, Toriko only kills animals that he deems worthy to be eaten. He does not just willy nilly kill any of God's creation. Only a REAL man could do that. For every manly character, there will have to be a less manly guy to enhance the manliness of the main character. For Batman, there is Robin. For Sherlock Holmes, there is Dr. Watson. In this case, for Toriko, there is Komatsu. Komatsu has his own set of special culinary abilities that furthur compliments Toriko's manliness. If Toriko was the fork and spoon, Komatsu is probably the condiments. What about the wimpy son problem? Heck, just show the government his MAL profile that he is currently watching "Toriko" He'll be exempted for life. In fact, "Toriko" isn't really an anime. The German government classified "Toriko" as "Handbuch für Männlichkeit"
Translation, Handbook for masculinity. Yeah, everything sounds manlier in German. Overall, as proven above, watching Toriko solves a whole tons of problems. I give this anime a rating of 8. Cause that's the number of packs you'll have after watching this anime. Yes, that's right, 8 packs! One more pack and you can play tick-tack-toe on your abs. How awesome is that? Not as awesome as Toriko though. Tough luck kiddo. The story of Toriko takes place in the Gourmet Age. In that world people live to eat. Wars can erupt over delicious food. 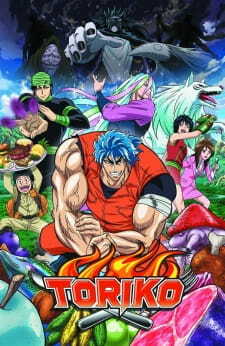 The main character Toriko and his partner Komatsu travel around the world to find exquisite ingredients. Toriko hunts, his partner cooks. This is the basic premise and I’ll be honest, it sounds stupid. Teenage heroes of other anime are trying to save humanity, planets, their family and friends from cool-looking edgy evil forces. But Toriko, a twenty five years old adult male, is chasing after food. It isn’t primarily a comedy anime to excuse the premise. Although soon it becomes clear that evil people can use rare food for their evil ends, it still isn’t enough to make most viewers take Toriko seriously. I’d like people to watch it but I will be honest. Toriko is mediocre at best. Despite its simple and not-too-intelligent premise, the story unfolds itself and turns out to be very complicated. For the first time in the history of shounen anime, the main character’s voracious appetite has a convincing reason: some people in this world have gourmet cells which can evolve and ultimately level up as they consume high-quality food. Because these cells demand an immense amount of energy, characters usually eat a lot. This constant need for better food makes the story dynamic. Villains and heroes vie for the best food to become stronger which opens up possibilities of immense change. As they get stronger, they search for the ultimate food that can make one the most powerful. Thus, many different groups, both righteous and evil, clash with each other over food. As the story progresses it gets very complex but nothing is out of control, the anime preserves its integrity. In other words, the basic premise is nicely developed. The animation successfully creates its original world. There’s a lot of talk on food. The beast and plants of the world are an amalgamation of different species of ours. They often look childish. Moreover, the world is very colorful. Bright colors are preferred for animation. This adds to the childish aura of the anime. Nevertheless, the animation is well done. Colorful scenes make fight scenes more fluid and add an extra dimension. As it’s expected from all 100+ episodes anime series, the budget of each episode is low. But when it comes to major fights it does not disappoint. Nothing top notch, yet well done. The sound is not exceptional either. Voice acting is well done. It brings out what it aims to do. Music is not so great as to be memorable. It still fits the general mood of the anime. You don’t feel like songs are out of place. One positive side of Toriko is that it doesn’t have many filler episodes. The number of filler episodes is 18 (13% of total) which is significantly lower than almost all long-running anime. Toriko isn’t great at character department either. Though many characters are usual clichés, there are some positively peculiar ones among them. One positive thing is that they are older than 21. This is consciously chosen because they usually consume a lot of alcoholic beverages. However, it isn’t used in a meaningful way. They don’t differ much from younger shounen heroes. The main character Toriko is a nice lead. What he lacks, his partner Komatsu provides. They complete each other (sadly, this isn’t a love story). Toriko’s friends Sani, Coco shine in terms of power. The anime does not fall into the trap of overpowered main character standing alone against the enemy, reducing the rest to a bunch of useless spectators who are there only to get impressed by the main character. Also, female characters do not have overgrown breasts, an oddity in this age. Overall, I enjoyed Toriko. Unlike other shounen, it requires a little more patience to be immersed in its world. But it’s painfully mediocre. WARNING: Anime doesn't cover all of the manga. Toriko is a series where MANLY MEN have gritty fights against villains & monsters for the sake of heroism & food. Many people have told me how much they hated the anime & prefer reading its manga, which is fine but I'm here to give my honest opinions about the animes pros & cons. Toriko's concept is one of hunting & cooking where our heroes "The 4 Heavenly Kings" (Toriko, Coco, Sunny & Zebra) explore the unknown lands of the Gourmet Age where exotic food stimulates power resulting into a war which purpose is to obtain "GOD"; the most sacred dish on the planet. Similar to Dragon Ball & One Piece, Toriko carries that same adventurous feel & welcomes its viewer into a imaginative world filled with unique animals & technology. A highlight of the series are its subtle references to Fist of The North Star with Toriko, Coco & Zebra being based on Kenshiro, Toki & Raoh among other things. As expected of battle shonens the series does deliver on fights sadly most of these battles do contain watered down violence. This is the main reason why most people just ignore the anime yet the adaptation serves better as a gateway due to its few crossovers with One Piece along with its soundtrack & usage of atmosphere in either the laid back scenes or the intense ones. Flaws of the anime include its later decrease in animation quality around the 100s & the filler ending to the series as the manga is still ongoing. Also I'm certain characters such as Komatsu & Tina will affect viewing experience in a negative way. While I suggest to do what you think is better (watching or reading) please give the series a chance as it was only recently in 2013 where people began to become fans of the series. While some scenes can feel dragged & its food concept ridiculous, don't forget that even Dragon Ball pokes fun in itself due its name choices (such as Trunks, Dr. Briefs, Tambourine, Drum & Piano). Don't let misconceptions affect your judgement as you may end up liking the series whether you watch or read it. Toriko is not the greatest series but does pay tribute to shonens of the 80s & 90s where it follows a straight forward story that offers imagination, gritty battles, monstrous villains & heroic characters. Okay, so to start I originally watched the first 20ish episodes of Toriko a couple years ago but then put it down because it just wasn't that appealing to me. Two weeks ago I decided to pick up the manga because I heard it was better than the anime. Still skeptical I powered past what happened in the anime, in the manga. After that, it was all downhill for me. I read through over 300 chapters of Toriko in a week. The characters and progressing story had me going through dozens of chapters a day. While the concept of a food world/combat may be a turn off for some, Toriko utilizes this to a high degree making each arc dynamic and different. I would highly recommend anyone to read this shonen. And I also recommend people to stay away from the anime because of the inconstancies between the show and manga, lack of brutality (edited out for child viewers), and also length. The anime only goes up to the Gourmet Festival. I am really enjoying Toriko and I feel it still has its best work ahead of it! PLEASE READ THE MANGA!!! And if you do watch the anime first, then watch it, then pick up the manga. I promise you it is totally worth it.